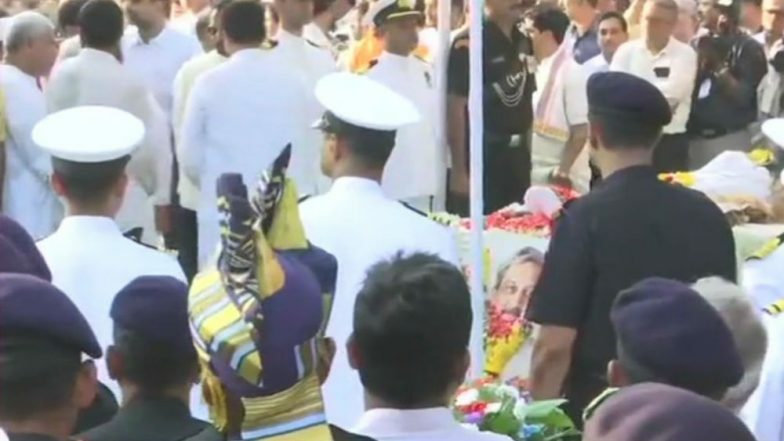 Panaji, March 18: Manohar Parrikar, the BJP leader who served as the Defense Minister of India and as the chief minister of Goa, has been cremated with full state honours on Monday evening. Parrikar, who was battling pancreatic cancer for the past one year, breathed his last on Sunday, March 17, 2019. Manohar Parrikar Dies at 63: From IIT Graduate to Defence Minister — Life And Times of The Late Goa CM. The funeral procession started from the Kala Academy, Panjim, at 4 PM and his last rites were performed at Miramar. Manohar Parrikar Dies After Suffering From Pancreatic Cancer, Goa CM Breathes His Last at 63. The mortal remains of Parrikar was kept at the BJP head office, Panjim, between 9.30 am to 10.30 am. Thousands gathered to pay their last respect to the leader. Manohar Parrikar 18th Indian Chief Minister to Die in Office. Prime Minister Narendra Modi also paid his last respects to Manohar Parrikar. PM Modi also spoke to Parrikar's family members. Manohar Parrikar Dies at 63: From IIT Graduate to Defence Minister — Life And Times of The Late Goa CM. The state of Goa has also announced seven days state mourning as a "mark of respect to the departed dignitary." The mourning will be observed from March 18 to March 24. During the period of mourning, the national flag will fly at half-mast on all the buildings throughout the state of Goa and there will be no official programmes related to entertainment." The Centre already announced one day of National Mourning on March 18, Monday. Manohar Parrikar was born in a middle-class Brahmin family which belonged to Mapusa on North Goa. Parrikar joined the Rashtriya SwayamSevak Sangh (RSS) at an early age and was also made the mukhya shikshak. Parrikar studied at IIT Bombay and earned a BTech in metallurgical engineering. He joined politics full time in the year 1988 when he was deputed to the BJP by the RSS. Parrikar contested elections for the first time in the year 1991 from North Goa Lok Sabha seat. He lost that election but won the Panaji seat in assembly elections in 1994, marking his debut in Goa assembly. On October 24, 2000, he became the chief minister of Goa for the first time and then went on to serve three more times, making him CM for fourth term. Parrikar was handpicked as the Defense Minister of India by Prime Minister Narendra Modi in 2014. It was during his tenure, in September 2016, that the surgical strike was conducted by an elite group of Indian Army in retaliation to the attack by Pakistan in Uri on Indian soldiers that resulted in 19 Indian jawans getting martyred. Parrikar is remembered for his leadership as the Defense Minister of India when the surgical strikes were undertaken.